I love the Sweet Child of Mine stamp set not only for the darling images but the wonderful phrases it contains! Like this one :) See the Bird from A Little Bird Told Me is stopping over to check out what his friends are up to at their house. Isn't it great that all the FCD sets coordinate so nicely together! It is a blessing to be able to mix and match images and phrases to meet your card needs. 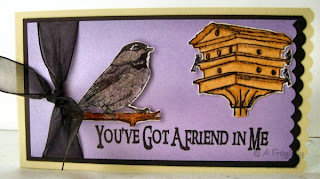 I stamped the phrase in Versamark and embossed it with black powder onto my shiny purple paper. I then stamped and colored the images with Copics and Prisma WaterColor pencils before cutting them out, then covering them with Versamark and clear embossing powder. I cut the shiny purple and black layering papers with my Paper Shapers and then mounted them to a smaller notecard that I also cut the ends on. I added a touch of ribbon and there you go a quick card to send to a friend. Thanks for taking a look today! Hope everyone is having a good day. It looks a little overcast here today and I am in a bit of a funk so I am going to go read a bit and hope I find myself a little better off this afternoon. love the card. is that a leftover from a cardstock?? love it if it is and that you used it for another card.